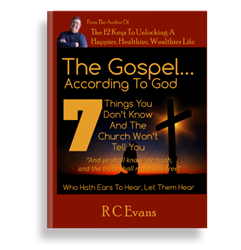 In his newest book, “The Gospel…According To God,” RC Evans identifies seven popular Christian doctrines that have been misinterpreted or misunderstood for centuries. An inspired guide; this book details how doctrine commonly preached in churches, in books, and on radio and television, is leading people away from the truth of God’s word. “The Gospel…According To God,” looks beyond the fables and endless genealogies designed to fill the pews and collection plates…shedding light on the weightier matters of Christianity and the life-changing tenets every Christian needs to know. This 115 page book is enlightening. It’s a quick read; but the depth of meaning is unparalleled. It will help readers understand why Jesus said to beware of the Scribes and Pharisees; and why he constantly warned of false teaching. “The Gospel…According To God” is controversial; shaking the pillars of organized religion. Challenging doctrines that have been preached for over 500 years is sure to rankle the religious elite; but as Evans points out, five hundred years ago people believed they had to pay the Pope to be forgiven. “The Gospel…According To God” shouldn’t be taken lightly. It is a “must-read” for Christians and an enlightening work for anyone who is confused about what they hear in church, on radio and television, or read in books. It is filled with scriptural references to support its positions and dispels some of the most revered Christian beliefs. Sometimes the truth hurts…this book is no exception. It sheds light on some of the most hallowed teachings of the church; but those who open their eyes, ears and hearts to the truth will be rewarded with a gospel that is not only logical and practical…it finally makes sense. Illuminated on Christmas Day, 1986, Ray Evans committed his life to serving God after a “Damascus Road” experience on January 13, 1987. He spent nine months in prayer and meditation growing in wisdom, knowledge and understanding of God and his ways; and over thirty-years walking and talking with God, waiting for his ministry to begin. The author of several inspired works, he is also the owner of SimpleGrafx, a digital marketing firm established in 1997 and several other on and offline businesses. DesertStream Publications began as a part-time ministry in 1992 to publish and market the books of Ray Evans (AKA RC Evans). There are no current plans to expand the author list.